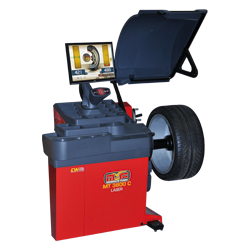 WheelBalancers-Mondolfo - Don Longo, Inc.
Mondolfo Ferro is the world leader in automotive service equipment, specializing in the production of tire changers, wheel balancers and wheel alignment machines including brake and suspension testers. Mondolfo Ferro's newest offering in this category is partic-ularly indicated for less experienced operators since it is extremely easy to use. 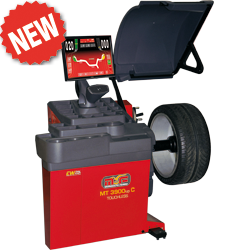 Perfect for Tire Assistance Centers, Dealerships, Workshops and Car Manufacturers dealing with large volumes. 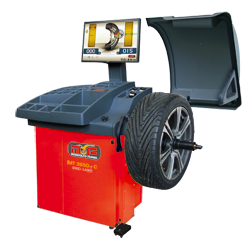 It is a fast, automatic Wheel Balancer and it works without ever touching the wheel. New digital gauge for acquisition of diameter and distance. Maximum precision and smoothness with integrated AUTOSELECT function which automatically activates the balancing programs, avoiding keypad selection. Wide-screen monitor ideal for displaying high resolution graphics and dedicated software. As standard, the Easy Weight program suite which included Minimum Weight. This software allows a significant reduction of balancing weights, through the analysis of different threshold values, according to the vehicle type: fast or slow (unique on the market).